Following on from the release of the Mikron Reverb, 112db has released another ‘little’ version of one of its plugins. 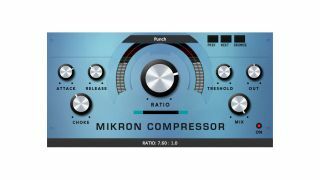 The Mikron Compressor rocks the same sound as the Big Blue Compressor, its larger sibling, but has a simpler control set. Despite the relative lack of tweakable knobs, 112dB says that Mikron Compressor is pretty flexible. It promises a tonal range that runs from transparent to warm and powerful, with tube-style saturation for a vintage sound. You can also adjust the wet/dry knob for New York-style compression. Mikron Compressor is available now for PC/Mac in VST/AU/AAX formats for $29 (regular price is $39). You can also download a demo. Find out more on the 112dB website.